Deploying ASP.Net applications is always fun when it comes to packages which are more complex then usual and require additional actions taken and this one is not an exception. After upgrade of operating system to Vista IIS 7 would be installed. This brings some “inconveniences” into usual development process. Aside from worrying about disabling UAC, few other things usually breaks. One of them is that setup package for ASP.Net application created in Visual Studio starts to fail with the error that installer session closed improperly and process has to be restarted (or similar). MSI (c) (B4:F0) [11:18:53:666]: Cloaking enabled. 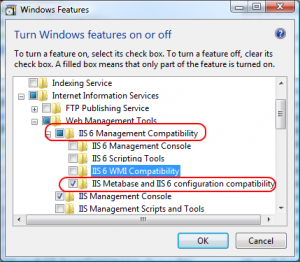 Very informational… Who would guess that it simply comes to support for IIS 6 API. 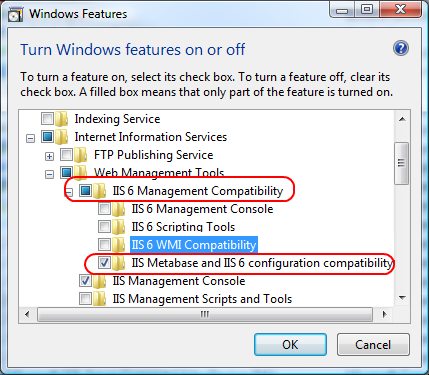 In IIS 7 it called “IIS 6 Management compatability”. 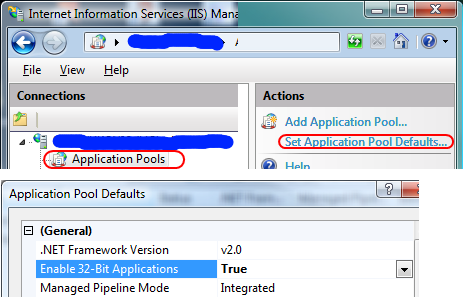 Usually this module is not installed by default and we have to actually enable it. Very simple and very quick solution is to go “Control Panel\Programs and Features\Turn Windows features on or off” and then click the check box. This entry was posted in Web-design and tagged enable 32 bit support in iis 7, iis 6 compatability in iis 7, iis 7 32 bit mode, windows installer and iis 7. Bookmark the permalink. Hi. 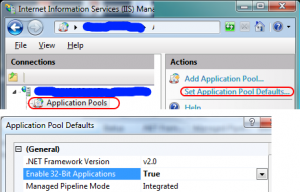 thanks for this article, it solved a huge issue migrating from Server 2003 to Server 2008 and IIS 7. Once I enabled 32 bit applications I could view the top level of our reports. However, as soon as a user tries to drill down in the report, the page comes up blank. Have you any information on what could be causing this, and what the solution might be? Could it be that security settings are not propagated for sub-reports? This post really helped me fix a similar problem where the error only occurs if I’m using a custom action.